Meiches, Benjamin 2019. Non-human humanitarians. Review of International Studies, Vol. 45, Issue. 01, p. 1. Boulton, Elizabeth G. 2018. Australian Contributions to Strategic and Military Geography. p. 69. Warren, Aiden 2018. Global Encyclopedia of Public Administration, Public Policy, and Governance. p. 2732. Nicholas, Lucy and Agius, Christine 2018. The Persistence of Global Masculinism. p. 115. Pashakhanlou, Arash Heydarian 2018. Air power in humanitarian intervention: Kosovo and Libya in comparative perspective. Defence Studies, Vol. 18, Issue. 1, p. 39. Blakeley, Ruth 2018. Drones, state terrorism and international law. Critical Studies on Terrorism, Vol. 11, Issue. 2, p. 321. Galliott, Jai 2018. The soldier’s tolerance for autonomous systems. Paladyn, Journal of Behavioral Robotics, Vol. 9, Issue. 1, p. 124. Galliott, Jai 2018. The Changing Scope of Technoethics in Contemporary Society. p. 135. Bentley, Michelle 2018. Fetishised data: counterterrorism, drone warfare and pilot testimony. Critical Studies on Terrorism, Vol. 11, Issue. 1, p. 88. Walker, James R. 2018. Visual Imagery and Human Rights Practice. p. 67. Enemark, Christian 2017. Drones, risk, and moral injury. Critical Military Studies, p. 1. Warren, Aiden 2017. Global Encyclopedia of Public Administration, Public Policy, and Governance. p. 1. Coeckelbergh, Mark 2016. The Future of Drone Use. Vol. 27, Issue. , p. 229. Koch, Bettina 2016. State Terror, State Violence. p. 151. Simpson, Thomas W. and Müller, Vincent C. 2016. Just War and Robots’ Killings. The Philosophical Quarterly, Vol. 66, Issue. 263, p. 302. Galliott, Jai 2015. Handbook of Research on Synthesizing Human Emotion in Intelligent Systems and Robotics. p. 386. Malito, Debora Valentina 2015. Building terror while fighting enemies: how the Global War on Terror deepened the crisis in Somalia. Third World Quarterly, Vol. 36, Issue. 10, p. 1866. Vorster, Nico 2015. Killing from a Distance: A Christian Ethical Evaluation of CIA Targeted Drone Killings. The Heythrop Journal, Vol. 56, Issue. 5, p. 836. 1 “Obama's Nobel Remarks,” New York Times, December 10, 2009; www.nytimes.com/2009/12/11/world/europe/11prexy.text.html. 2 While the military employs a wide range of unmanned aerial vehicles, this paper will focus exclusively on Unmanned Combat Aerial Vehicles, which we refer to as drones. Drones are different from robots, which denote completely autonomous machines, whereas “unmanned” systems are remotely controlled by human operators either prior to and/or during their flight. There are currently three kinds of drones: fully autonomous (preprogrammed before flight), semiautonomous (requiring ground input during critical portions of flight, including weapons employment), and fully ground-controlled. 3 Singer, “P. W., Wired for War: The Robotics Revolution and Conflict in the 21st Century (New York: Penguin Press, 2009), p. 194. 4 Lazarski, Anthony, “Legal Implications of the Uninhabited Combat Aerial Vehicle,” Air & Space Power Journal (March 27, 2001). 5 For example, see the North Dakota Law Review special issue in 2009 on “Complying and Flying: Legal and Technical Issues Relating to the Operation of Unmanned Aerial Systems”: North Dakota Law Review 85, no. 3 (2009). 6 Kenneth Anderson, U.S. Congress, House of Representatives, Committee on Oversight and Government Reform, “Rise of the Drones: Unmanned Systems and the Future of War,” Hearing before the Subcommittee on National Security and Foreign Affairs, 111th Cong., 1st sess., March 23, 2010. 7 O'Driscoll, Cian, “Learning the Language of Just War Theory: The Value of Engagement,” Journal of Military Ethics 6, no. 2 (2007), pp. 107–16, at 113. 8 See, e.g., Kolff, Diederik W., “Missile Strike Carried Out With Yemini Cooperation—Using UCAVs to Kill Alleged Terrorists: A Professional Approach to the Normative Bases of Military Ethics,” Journal of Military Ethics 2, no. 3 (2003), pp. 240–44; Arkin, Ronald C., “The Case for Ethical Autonomy in Unmanned Systems,” Journal of Military Ethics 9, no. 4 (2010), pp. 332–41; and Strawser, Bradley Jay, “Moral Predators: The Duty to Employ Uninhabited Aerial Vehicles,” Journal of Military Ethics 9, no. 4 (2010), pp. 342–68; for an exception, see Sharkey, Noel, “Saying No! to Lethal Autonomous Targeting,” Journal of Military Ethics 9, no. 4 (2010), pp. 369–83. 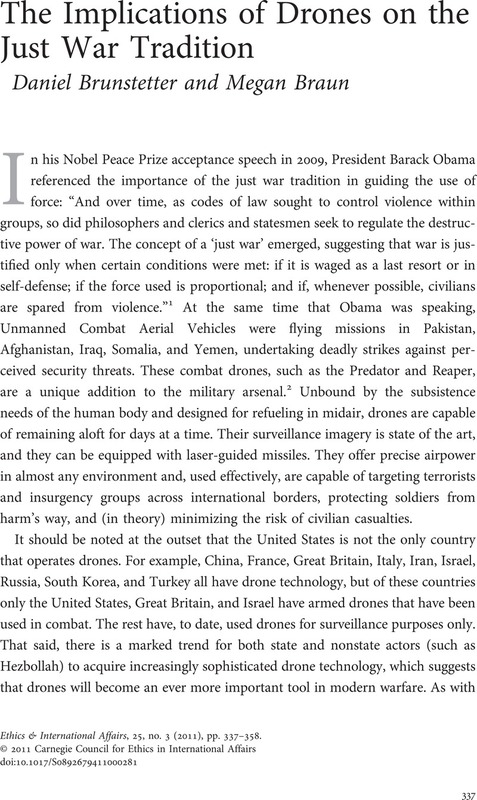 The author, however, does not address the ethical challenges drones pose to just war principles. 9 Drew, Christopher, “Drones Are the U.S. Weapons of Choice in Fighting Qaeda,” New York Times, March 17, 2009; www.nytimes.com/2009/03/17/business/17uav.html. 10 Kolff, “Missile Strike,” p. 240. 12 New American Foundation, “The Year of the Drone”; counterterrorism.newamerica.net/drones; accessed March 29, 2011. Information about drone attacks in Pakistan is often contradictory and widely divergent. The New America Foundation research “draws only on accounts from reliable media organizations with deep reporting capabilities in Pakistan, including the New York Times, Washington Post, and Wall Street Journal, accounts by major news services and networks—the Associated Press, Reuters, Agence France-Presse, CNN, and the BBC—and reports in the leading English-language newspapers in Pakistan—the Daily Times, Dawn, the Express Tribune, and the News—as well as those from Geo TV, the largest independent Pakistani television network”. 13 Major General Timothy McHale, U.S. Army, “Memorandum for Commander, U.S. Forces-Afghanistan, Subject: Executive Summary for AR 15-6 Investigation, 21 February 2010 CIVAS incident in Uruzgan Province,” U.S. Forces Report, May 29, 2010. 14 Shane, Scott and Schmitt, Eric, “CIA Deaths Prompt Surge in U.S. Drone Strikes,” New York Times, January 22, 2010; www.nytimes.com/2010/01/23/world/asia/23drone.html. 16 Walzer, Michael, Just and Unjust Wars: A Moral Argument with Historical Illustrations, 4th ed. (New York: Basic Books, 2006), p. xiii. 17 For a summary of recent arguments in the tradition, see Rigstad, Mark, “Jus ad Bellum After 9/11: A State of the Art Report,” ITP Beacon 3 (2007), pp. 1–30, at 3–4. 18 Crawford, Neta, “Just War Theory and the U.S. Counterterror War,” Perspectives on Politics 1, no. 1 (2003), pp. 5–25; Bellamy, Alex J., “Is the War on Terror Just?” International Relations 19, no. 3 (2005), pp. 275–96; Daniel R. Brunstetter and Dana Zartner, “Just War against Barbarians: Revisiting the Valladolid Debates between Sepúlveda and Las Casas,” Political Studies, no. doi: 10.1111/j.1467-9248.2010.00857.x; and Nardin, Terry, “Humanitarian Imperialism: Response to ‘Ending Tyranny in Iraq,’” Ethics & International Affairs 19, no. 2 (Summer 2005). 19 O'Driscoll, Cian, The Renegotiation of the Just War Tradition and the Right to War in the Twenty-First Century (New York: Palgrave Macmillan, 2008), p. 163. 20 Bellamy, “Is the War on Terror Just?” p. 286. 21 Mayer, Jane, “The Predator War: What Are the Risks of the C.I.A. 's Covert Drone Program?” New Yorker, October 26, 2009; www.newyorker.com/reporting/2009/10/26/091026fa_fact_mayer. 22 Walzer, Just and Unjust War, pp. xv–xvi. 24 Walzer, Michael, Arguing About War (New Haven, Conn.: Yale University Press, 2004), pp. 155, 88. 25 Totten, Mark, First Strike (New Haven, Conn.: Yale University Press, 2010), pp. 186, 172, 183. 26 Walzer, Arguing About War, p. 88. 27 Jenks, Chris, “Law From Above: Unmanned Aerial Systems, Use of Force, and the Law of Armed Conflict,” North Dakota Law Review 85, no. 3 (2009), pp. 649–71, at 671; compare pp. 656–62. 28 Mary O'Connell, U.S. Congress, House of Representatives, Committee on Oversight and Government Reform, “Rise of the Drones II: Examining the Legality of Unmanned Targeting,” Hearing before the Subcommittee on National Security and Foreign Affairs, 111th Cong., 2nd sess., April 28, 2010. 29 Walzer, Michael, “On Fighting Terrorism Justly,” International Relations 21, no. 4 (2007), pp. 480–84, at 480. 32 CNN Wire Staff, “Pakistanis Protest U.S. Drone Action,” April 24, 2011; www.cnn.com/2011/WORLD/asiapcf/04/24/pakistan.drone.protest/index.html?iref=allsearch; accessed April 26, 2011. 33 “Effective Counterinsurgency: The Future of the U.S. Pakistan Military Partnership,” Hearing of the House Armed Services Committee, April 23, 2009. 34 Ackerman, Spencer, “Under McChrystal Drone Strikes in Afghanistan Quietly Rise as Civilian Casualties Drop,” Washington Independent, January 14, 2010; washingtonindependent.com/73915/under-mcchrystal-drone-strikes-in-afghanistan-quietly-rise-as-civilian-casualties-drop. 35 New America Foundation; counterterrorism.newamerica.net/drones; accessed March 30, 2011. 36 Saban Center for Middle East Policy, “Iraq Index: Tracking Variables of Reconstruction & Security in Post-Saddam Iraq,” Brookings Institute, December 30, 2010; www.brookings.edu/iraqindex. 37 Singer, Wired for War, p. 349. 39 Associated Press, “Predator Pilots Suffer War Stress,” August 8, 2008; www.military.com/news/article/predator-pilots-suffering-war-stress.html?col=1186032310810&wh=news. 40 Walzer, Just and Unjust Wars, p. 156. 41 Walzer, Michael, “Kosovo,” Dissent (Summer 1999), pp. 5–7. 42 Bellamy, “Is the War on Terror Just?” p. 289. For more information on the question of the degree of risk soldiers should be required to undertake in order to protect civilians, particularly in the context of drones, see Strawser's arguments in “Moral Predators,” pp. 343–46. 44 Bellamy, “Is the War on Terror Just?” p. 289. 45 Adam R. Pearlman, “Legality of Lethality: Paradigm and Targeted Killings in Counterterrorism Operations,” Social Science Research Network, March 23, 2010; ssrn.com/abstract=1583985. 46 Gross, Michael, Moral Dilemmas of Modern War: Torture, Assassination, and Blackmail in an Age of Asymmetric Conflict (Cambridge: Cambridge University Press, 2010). 47 “UN Rights Expert Voices Concern over Use of Unmanned Drones by United States,” UN News Centre, October 28, 2009; www.un.org/apps/news/story.asp?NewsID=32764&Cr=alston&Cr1. 48 Risen, James and Johnston, David, “Threats and Responses: Hunt for Al Qaeda; Bush Has Widened Authority of C.I.A. to Kill Terrorists,” New York Times, December 15, 2002; www.nytimes.com/2002/12/15/world/threats-responses-hunt-for-al-qaeda-bush-has-widened-authority-cia-kill.html. 49 Zenko, Micah, Between Threats and War: U.S. Discrete Military Operations in the Post–Cold War World (Stanford: Stanford University Press, 2010), p. 159, n. 6. 51 General Stanley McChrystal, U.S. Army, “Memorandum for Record, Subject: AR 15-6 Investigation, 21 February 2010 U.S. Air-to-Ground Engagement in the Vicinity of Sahidi Hassas, Uruzgan Province, Afghanistan,” U.S. Forces Report, May 29, 2010. 52 Sharkey, “Saying No!” p. 376. 53 Mary L. Dudziak, “To Whom Is a Drone Loyal?” Balkinization blog, September 27, 2009; balkin.blogspot.com/2009/09/to-whom-is-drone-loyal.html. 54 James Pattison, “Just War Theory and the Privatization of Military Force,” Ethics & International Affairs 22, no. 2 (Summer 2008), pp. 143–62, at 151–52. 56 Walzer, Just and Unjust Wars, p. 288. 58 Lang, Anthony F. Jr., “The Politics of Punishing Terrorists,” Ethics & International Affairs 24, no. 1 (Spring 2010), pp. 3–10. 59 Singer, Wired for War, p. 172; and “Boeing Wins DARPA Vulture II Program,” September 16, 2010; boeing.mediaroom.com/index.php?s=43&item=1425.